and, for the first time we were on course! sailing was over. 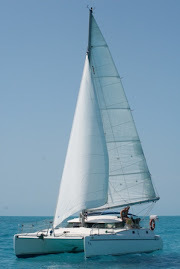 We put the other sails up again and tried to head north. much happier. Because, it is what we base our decisions on! the looming monster cloud anymore. climbed the sky, its light erased the little twinkles of stars one by one. reach 17° S! Will we beat this front?